As healthcare reform rapidly changes to a value-based model, clinicians will be more accountable than ever for the quality of care delivered to patients—and interventional radiologists are no exception to the rule. This area of radiology is facing new reimbursement cuts,particularly in the hospital setting, impacting decisions on how to treat patients. Simultaneously, the volume of patients undergoing interventional procedures is on the rise as image-guided therapies are fast provingt he best option for patients with a wide variety of pathologic entities, and as innovation in technology and techniques continue to improve patient care. 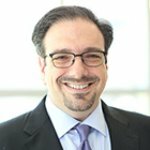 As part of Applied Radiology’s commitment to provide the interventional radiology community useful information that is immediately applicable in the clinical setting today, we have launched a new quarterly column, Interventional Radiology, spearheaded by Neil K. Goldstein, MD, Interventional Radiologist, Pedes Orange County, Newport Beach, CA. In our debut of the Interventional Radiology column, Applied Radiology spoke with Dr. Goldstein about the cutting-edge techniques and new technologies used to perform atherectomy of the lower extremities. Applied Radiology (AR): What are some unique features of your practice? is favored when symptoms or significant findings on diagnostic studies are present. We also have a large vein clinic where we treat chronicvenous insufficiency associated with varicose veins, venous skin ulcers as well as deep vein thrombosis (DVT), and venous stenosis. AR: What are the benefits of practicing in an outpatient vascular center? NKG: Working in an academic practice does afford the comfort of having a large interdisciplinary team to work with; however, it can become difficult to practice independently in that setting. A lot of the decision making tends to be taken out of the interventional radiologists’ hands, either by the patient’s admitting physicians or by budgetary constraints with regards to equipment and staffing. By comparison, in a purely outpatient practice there is more autonomy and direct control over the quality of care provided. Furthermore, the experience for the patient is much improved—no bureaucratic registration process and long waits with inpatients, emergencies, and outpatients mixed together. An outpatient office is also more cost-effective for patients. If you look at the burden of cost to the healthcare economy, Medicare patients for example,2 there is a huge economic impact in managing PAD in an outpatient setting. When these patients have surgeries or amputations in hospitals, the costs are astronomically higher, morbidity increases, and longevity is reduced. If you can manage these patients by endovascular first-line therapy in the outpatient setting, the cost is significantly lower, the experience is better, and the long-term results are better. There are benefits of an outpatient practice for practitioners as well. Most hospital-based radiology groups have an outpatient presence and need to split their resources between the hospital they are beholden to and the outpatient setting. By working solely in an outpatient setting, we are able to converge our focus and resources and focus on treating vascular disease, which is at the core of interventional radiology.All of this is accomplished in the most effective way for our patients. Are there particular challenges to this type of practice? NKG: Most significantly, there has been in recent months the threat of sharp cuts in reimbursement for atherectomy in the outpatient setting.This is a disservice to patients in the long run as it will likely drive down research and development in the field, threaten the viability of practices, and reduce treatment options for patients. How are patients with lower-extremity vascular disease best managed? NKG: Our first-line approach for lower extremity ischemia is endovascular revascularization, primarily via atherectomy, which removes calcified plaque. This technology has evolved over a long period of time and currently there are several different types of equipment that use different paradigms to approach removing plaque. One method is directional atherectomy, which can be employed, for example, by the TurboHawk Plaque Excision System by Coviden (Plymouth, MN). It is catheter based and literally shaves plaque off the wall of the blood vessel in thin strips, and then collects it in the receptacle of the catheter. Potentially, eccentric plaque can be removed without disturbing the endothelial lining of the opposing wall of the artery. The procedure tends to be time-consuming especially when there is a long lesion or a circumferential lesion. Rotational atherectomy is employed by several devices, one being the Rotablator Rotational Atherectomy System by Boston Scientific(Natick, MA). This had been used in coronary atherectomy for some time and has an indication in the periphery as well. This device has a burr on the end of it and rotates at high speed around a guidewire. There is a fine grain to the burr that sands the calcium in the plaque down to a diameter of about 7 microns, small enough to pass through the capillary bed. The debris travels with the circulation back to the lungs where the reticuloendothelial system reabsorbs the particulates. Another device that similarly uses rotational energy is the Stealth 360 Orbital Atherectomy System by CSI (St. Paul, MN). Similarly thereis a burr on the end of the wire, but it is eccentrically oriented to the wire so that when it spins at faster speeds you get a wider radius of rotation for either deeper sanding of the plaque or treatment of a larger vessel diameter. It is similar in that it is sanding the plaque down to a very small particle size. The technique with these devices is primarily to keep the load of distal embolization as low as possible at any given time.I find these devices best suited for smaller, more peripheral vessels. Finally, there is another rotational atherectomy device called the JetStream Atherectomy System by Bayer Healthcare (Indianola, PA).The JetStream is a slightly larger catheter device with a cutting surface at the front, consisting of a series of blades. As this device rotates, it digs a tunnel through the plaque ahead of itself. Unique to this device, it also aspirates the material back out at the same time.It has an indication for treating calcified plaque like the other devices, but it can also treat noncalcified plaque, in-stent intimal hyperplasia, and thrombus, and there is an indication for it to be used as a thrombectomy device. 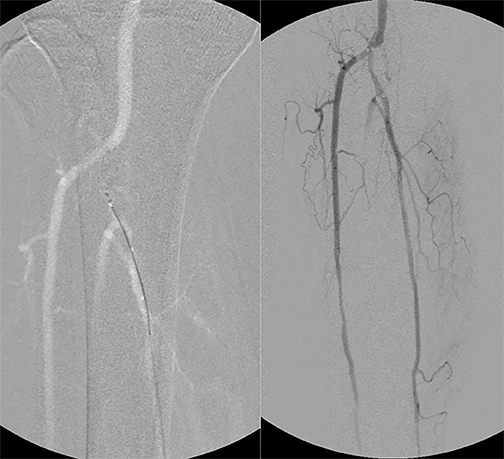 The JetStream results in less distal embolization than the other devices. There are 4 sizes of the device and the larger 2 sizes have bidirectional rotation, whereby there isa smaller diameter cutting surface in the clockwise rotation with larger blades that fan out when in a counter-clockwise spin (Figure 1). Because of the multiple indications, the ability to aspirate the plaque material, the ability to treat thrombus as well as plaque, and the variable size option for larger vessels, the JetStream tends to be our go-to device for most clinical situations. One limitation of that device is difficulty getting down to the distal tibial arteries due to size. It’s easier to use in the more proximal vessels. NKG: All of these devices require crossing the occlusive lesion in the vessel and advancing a wire and catheter through before use. This is not always possible, as chronic, heavily calcified plaque can sometimes be impenetrable even by the stiffest wires and catheters. The Crosser by Bard (Tempe, AZ) is a smaller wire-like catheter device intended to be used to cross the occluded lesions that cannot be penetrated with a regular wire or catheter. There is a smaller caliber, higher energy version as well as a slightly larger over-the-wire model. With an ultrasonic activated tip at the end of the wire that pulverizes calcified plaque and jackhammers its way through, it provides a channel for the working guidewire to advance particularly at the proximal and distal cap of the occluded segment where calcification is heaviest. This smaller atherectomy device permits treatment for lesions that you otherwise might not be able to treat at all and can also be used from a retrograde approach, providing the option to treat lesions from distal tibial or pedal access. All of the devices, including the Crosser, depend on the calcium in the plaque to have their effect, as the hard calcium can be broken up by the devices, whereas the softer endothelium of the vessel is able to push away from the device without injury. For example, if you took a nail file to your fingernail, versus your finger tip, the effect is very different. However, the removal of calcified plaque allows for more compliance and easier remodeling of the plaque and vessel wall so that lower pressure balloon inflation is generally required to achieve a good result, reducing potential barotrauma to the vessel. AR: Is patient safety a particular concern in an outpatient facility? NKG: We are taking care of patients that are as symptomatic and medically complex as any patient at a major hospital facility. If you consider the conditions PAD is associated with—diabetes, coronary and cerebrovascular disease, hypertension, renal insufficiency, smoking, and advanced age, and most patients with these conditions on some anticoagulation regimen—almost all of our patients are technically high risk. However, we take precautions with these patients, particularly the patients with, for example, renal insufficiency. Since iodine-based contrast agents can cause contrast-induced nephropathy (CIN), we try to stage interventions and restrict the dose of contrast to 100 cc on a given day. We only use isosmolar nonionic contrast, and we dilute it to 50% with saline. For patients with low glomerular filtration rate, between 30 and 60, we infuse fenoldopam directly into the renal arteries through small catheters inserted via a separate puncture site. This medication is a vasodilator that works by preventing the vasospasm that occurs in response to contrast administration in the kidneys and reducing the ischemia to the nephrons. In the past, intravenous administration of the drug was limited by hypotension, so a therapeutic effect was rarely achieved, however, by infusing directly into the renal arteries during the procedure, we can reach a therapeutic level of the drug targeted to the kidneys without the severe systemic side effects. For patients with GFR <30, we use CO2 gas as a contrast agent. The fact is that these patients are high risk for any procedure, certainly including surgery, so to the extent that we can save them a major surgery or amputation, general anesthesia, a long recovery time, or exposure to hospital born infections, we can provide a significant benefit to patients without adding to the risk of treatment. AR: How do you optimize the results of these interventions? NKG: We use a variety of sophisticated techniques to optimize results. For example, if you can’t cross an occlusive lesion from an antegrade approach, the retrograde or SAFARI (subintimal arterial flossing with antegrade retrograde intervention) technique can be used, where access is gained through the patent distal tibial or pedal arteries and the wires or devices are passed back up through the occlusion (Figure 2).The wire can then be retrieved through the original femoral puncture site so it exits at both ends giving you control of the wire to advance the atherectomy device and balloon catheters. We also aim for revascularization targeted to the angiosomal territory of the tissue loss, such as anon-healing wound or gangrene in the setting of tibial artery occlusion. The traditional surgical approach was to provide flow to the best vessel, or the one most likely to be an easy target for bypass. Unfortunately, this doesn’t work well as regions of the foot are supplied by specific branches of the tibial arteries and in many PAD patients, such as diabetics, the collateral flow between territories is poor. Therefore you need to plan to revascularize the tibial or major collateral branch that directly supplies the wound for the best chance at healing. Sometimes this requires multiple staged interventions to achieve.As more technically complex interventions on more challenging lesions and medically complex patients are being performed at outpatient sites, an expansive inventory of product, or access to alternatives, such as coronary-sized devices, may not be immediately available.While efficacious, these procedures are not without some inherent risks, particularly vascular complications, such as vascular injury (dissection, rupture, thrombosis, or spasm), distal embolization, and contrast-induced nephropathy. Knowledge and availability of “bail out” devices is helpful in critical situations and can extend the population of patients that can be safely managed in the outpatient setting. Some occlusive lesions are actually a mix of calcified plaque, intima, and thrombus. The only device that has an indication for thrombectomy, in addition to atherectomy, is the JetStream. Not only does it reduce the risk of distal embolization by thrombotic material through itsaspiration mechanism but it can be used to treat embolization or thrombosis should this occur during an intervention. Distal embolic protection wires can also be employed, however, not all embolic capture devices are compatible with all atherectomy devices. All of the atherectomy devices have advantages and drawbacks, as well as steep learning curves and particular compatibilities with wires and sheaths. The CSI and the Rotablator can go into more distal vessels than the JetStream, therefore, these are my first choices in distal tibials or pedal arteries. Given the high prevalence of vascular disease, finding the most cost-effective means of caring for these patients is critical. 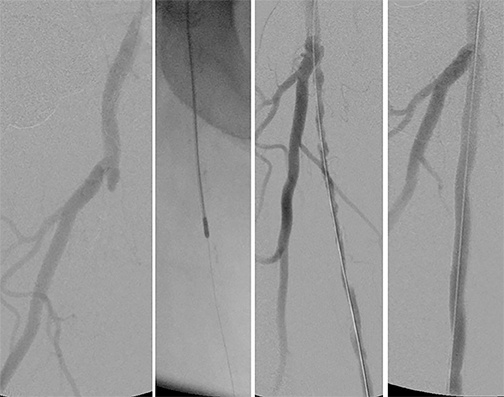 Revascularization is the best first-line therapy for the critically ischemic leg, with the best strategy for this being an endovascular approach, angiosome targeted, and employing one of the various methods of debulking and reducing the plaque burden via atherectomy. Sophisticated techniques have enabled these interventions to be successful, even in distal vessels, and to be performed on more medically complex patients with more advanced disease. The need to do interventions in a cost-effective manner validates the development of outpatient vascular centers, combining comfort and efficiency with good outcomes and cost savings as well as autonomy for the interventional radiologist. While financial pressures, including reimbursement cuts, are ever looming, it is important to recognize the value of this treatment paradigm. Franzone A, Ferrone M, Carotenuto G. The role of atherectomy in the treatment of lower extremity peripheral artery disease. BMC Surgery. 2012;12(Suppl 1):S13. doi:10.1186/1471-2482-12-S1-S13. Essentials of atherectomy: Tips and techniques. Appl Radiol. Dr. Goldstein is an Interventional Radiologist at Pedes Orange County, Newport Beach, CA.